"Very good. The materials and craftsmanship of this wallet are very high quality. It was pretty stiff for a couple of weeks with the area of the fold pushing into my inner hip. After a couple of weeks the leather loosened up and the corner of the fold that was causing the issue rolled over just a bit and now it feels good." 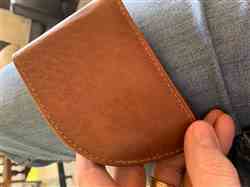 "I have been using a front pocket wallet in some form or fashion for the last 30+ years. This is truly the first one that has actually been comfortable to carry and use. Great job!" "My husband loves the front pocket shape. Although the wallet is a second, you would never even know it. He loves his new wallet. Very highly recommended." "Really like it. The shape configures well in your front pocket which is unique!" "It took a few days to break in & get used to but once I carried this wallet for a bit I can't see myself without it. Great quality even for a second(couple of surface scratches)& saves my back"
"Enjoying my first front pocket wallet. The moose skin is great, smooth getting in and out of my 501 Levi's jeans. The leather color looks good, like it has been used but still like new. The leather is strong, tough and is keeping it's shape. I love it. It was easy to order, came on time and was exactly as advertised. Good company!" "Fits much more comfortably into my front pocket than any wallet I have ever owned, even stuffed with a dozen +/- credit cards!" "It is a great wallet. Fits into you pocket neatly, nice and compact, yet holds all the essential things such as credit cards and money. Fantastic wallet "
"Great, just what I needed!" "It was a great conversation topic . A lot op folks said they where buying one. Thanks "
"In answer to your question the overall experience was great! Thank you for another great product." "Love the wallet and the idea for a safe and comfortable place to hold your wallet when traveling or whenever, it's just takes a little bit of time to get used to "
"Best front pocket wallet I have ever used and I have been using one for 20 years. The moose is very attractive and very durable, and the Nantucket opens the correct way. " "My husband has one of these front pocket wallets and loves it, so I bought one for my father too. " "These wallets are just the right size. They can hold many credit cards securely. I like the RFID protection it offers." "Great wallet! And made in USA. But why aren't your other products, including other wallets in your collection not domestically produced? I previously owned one of your cloth (of foreign origin) wallets and really liked it's size. This new wallet is just slightly wider and it takes a little getting used to. I'd be happier if it were a bit slimmer but still a high quality product." "The construction quaintly is very good. No rough or I trimmed edges. If you have a LOT of credit cards, you may want something bigger. The wallet has a very slim silhouette and is not noticeable in a front pocket. I think it’s a novel idea worth investigating. " "From the order, to receiving the wallet; to wearing the wallet was great. " "Love it, Been using Front Rouge wallets for 11 years." I Love my Front Pocket Wallet! "I bought the genuine moose leather 6 card space front pocket wallet. At first I thought that I would have a hard time getting used it. However, it holds everything I want in my wallet and is not bulky. I can switch it from pocket to pocket and in case I need to put it in the back pocket I can do that. It is comfortable and made very well. I will buy another when this one needs to be replaced. I would recommend this wallet to anyone! " "I have used a front pocket wallet for 19 years and this is the best one in both quality and ease of use that I have ever experienced." "I guess it works as I haven’t been hacked, so far so good." "Great. It fits wonderfully in my pocket." "This tote is the perfect size to carry my purse, iPad, and the other small items I travel with everyday. Well made and attractive!" "I bought a Bison Wallet about 7 years ago, and used it hard. I have wanted an Alligator or Ostrich and there has never been a perfect time. It went on sale last week, I pulled the trigger and got the Black. It came yesterday and I’m blown away. Very thick heavy leather durable and gorgeous. I looked at name brands and they were double triple or even quadruple the price. Beyond happy." "I love it, just getting use to it, but feel so much better than that thick wallet I have been sitting on for all those years. " "Love the size, shape and not having a wallet in my back pocket digging into my backside. " "Love the wallet, but I decided I needed an ID window so ordered it in moose leather!"